A study TriMet commissioned last year found no bias in the agency's fare-enforcement practices. And yet, an analysis of racial disparities for this series showed African-Americans are disproportionately charged with the most serious of transit violations - a finding confirmed in an independent analysis by local prosecutors. The video shows what most people saw: a TriMet rider, 25, black, male, tall, standing aside a squad car on a summer afternoon, surrounded by three police officers. The issue? A disturbance on a bus. What you hear, though, are shouts from the other riders. "He didn't cuss at them and he has a ticket." As the scene unfolds, it seems like nobody knows why the man is being arrested. Even Brandon Dean, the man in the handcuffs, who spent 10 hours hungry in a downtown jail cell, is still unsure. Failing to have a valid TriMet ticket can lead to a variety of sanctions. Sitting behind bars, Dean faced two charges. The first was theft of services, for failing to have a valid fare, a minor misdemeanor akin to shoplifting. The second charge was interfering with public transit for delaying the bus. It's a more serious misdemeanor charge, with penalties on par with driving drunk or a domestic assault. Eventually, Dean was released and he walked home near Southeast 145th Avenue and Division Street, wondering what most everybody else wondered: Why, exactly, did he get arrested? In the video, it appears police verified Dean had a ticket to be on the bus he presumably disturbed, though it's not mentioned in the police report. Bus driver accounts diverged sharply from Dean's own statements, in which he insists he'd showed his fare. They also diverge from witness accounts to police about what exactly happened on the bus. In the end, prosecutors dropped the theft-of-service charge. 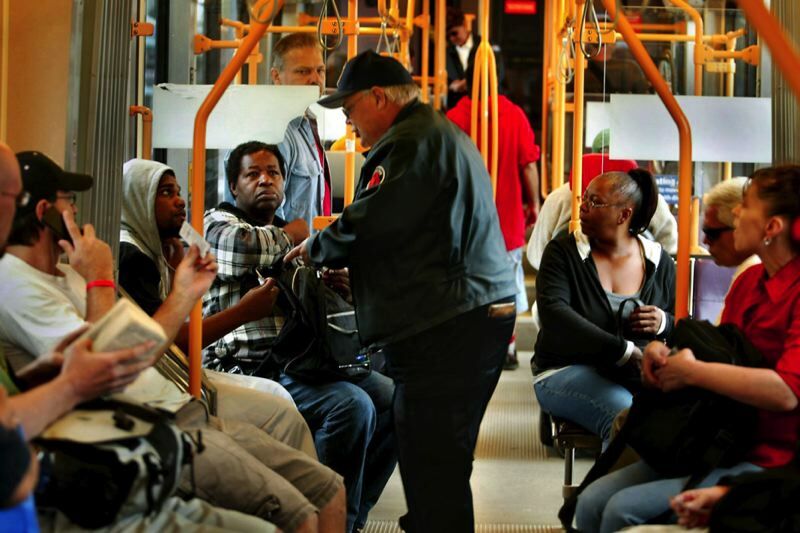 It's a tale that underscores tensions between TriMet and some of its African-American riders. A study TriMet commissioned last year found no bias in the agency's fare-enforcement practices. And yet, an analysis of racial disparities for this series showed African-Americans are disproportionately charged with the most serious of transit violations — a finding confirmed in an independent analysis by local prosecutors. African-American transit riders had long complained they were targeted for enforcement on trains and buses. So, last year, at TriMet's request, Portland State University's Criminal Justice Policy Research Institute studied two years of enforcement data and found that fare inspectors and supervisors did not disproportionately charge African-American riders with skipping fares. However, that study did find that African-American riders were more likely than whites to be excluded from trains and buses. At the time, TriMet characterized the variances found in the PSU study as slight. And when the data are sliced one way, disparities were slight. What the study did not include, however, was a thorough analysis of another common charge — one that Dean got: interfering with public transit, known as IPT. Our analysis, which includes 10 years of state court data, shows that African-Americans have been charged with IPT at a rate up to 6.4 times the rate of white riders over the past decade. TriMet did not track IPTs, because only sworn police officers, not TriMet personnel, can enforce an IPT charge. But many — and likely most — of those IPT charges came from local police working closely with TriMet on the regional Transit Police Division, which uses 68 cops from 15 police agencies spanning three counties to prevent and respond to crime throughout the TriMet system. The Transit Police Division is run by the Portland Police Bureau but is closely tied to — and funded by — the transit agency. Nonetheless, TriMet chose not to include statistics linked to transit police when its reports of slight enforcement disparities made headlines in December 2016. That meant a lot of cases weren't reflected in the data. Before the July 25 scuffle with police, Dean's day was an ordinary one. He left his house and boarded a bus at Southeast 148th and Division, heading to a job as a parking attendant at the Portland International Airport. He was tired after working 10 hours the day before. Dean says that explains, in part, why he accidentally spent the cash for his fare on food. Dean agreed to pay for his fare through a TriMet phone app and got an OK from the driver to get on the bus. He took a seat and attempted to add electronic tickets on his phone with the app, but his credit card didn't work. What followed might have been a simple misunderstanding. Dean says when the TriMet app rejected his card, he called his girlfriend to use hers. The driver's account makes clear that the phone call became a flashpoint: He saw Dean talking on the phone instead of getting straight to the fare. In Dean's account, he got his girlfriend's credit card number, paid for a ticket with the phone app and, within a few blocks, flashed his phone forward so the driver could see he had a valid ticket. The driver disputes that he ever saw a ticket — just a blank screen. He asked to see the fare again. And Dean bristled. Dean said he took issue with the second request. He'd already shown his ticket and didn't see a reason to keep proving that he had paid. And he wanted to get to work. The driver pulled the bus to the side of the road near 145th Avenue and Division and asked Dean if he wanted to get off or wait for a supervisor. Other passengers offered to pay for another ticket for Dean. The driver refused. When a second bus came, Dean flashed his phone again and got on it. But after a conversation between the two drivers the second bus stayed parked. The second driver said she, too, didn't see a ticket on the phone. Eventually, a supervisor arrived with a police sergeant, followed by a police officer and a sheriff's deputy — all assigned to the Transit Police Division. They arrested Dean and charged him with theft of service (for riding the bus without proof of fare) and interfering with public transit (because he held up the bus instead of getting off). But the police reports show inconsistency among the officers about why they arrested Dean — whether for failing to pay the fare or creating a disturbance. The theft-of-service charge never did stick to Dean, who insisted he had a valid ticket on his phone. But prosecutors charged him with the IPT. Between May 2015 and April 2016, the most recent year for which data are available, African-Americans were charged with IPT 182 times — a full third of all charges. PSU criminologist Brian Renauer, in examining TriMet's enforcement data, found African-Americans were twice as likely to earn citations for fare-skipping than their white counterparts during platform- and on-board ticket inspections. But since African-Americans also self-reported being twice as likely to skip the fare in a TriMet survey, there was no disparity. But Renauer also noted that African-Americans made up 22 percent of those excluded from trains and buses in the years he examined, though they made up 18 percent of fare-evasion incidents. It was that gap, according to Multnomah District Attorney Rod Underhill, that prompted him and the DAs in Clackamas and Washington counties to announce in January that they will no longer charge TriMet riders like Dean with interfering with public transit. 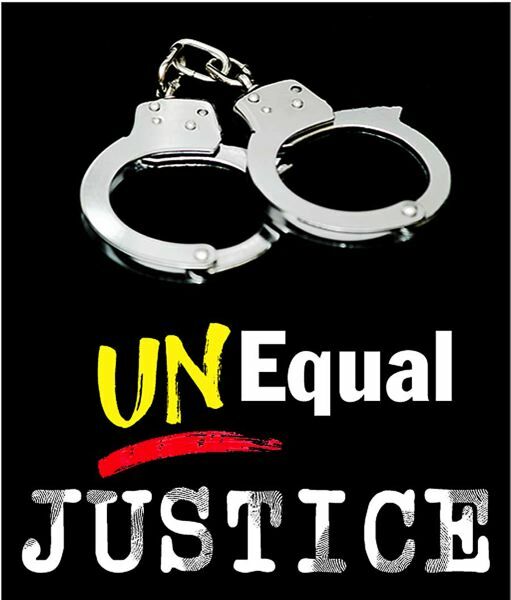 The prosecutors were concerned that higher levels of IPT charges issued to African-Americans were the result of the exclusions that Renauer had noticed. That's because passengers caught riding a bus or train after being excluded often were among those charged with interfering with public transit. Last summer, Underhill shared with TriMet that black riders on its system were being charged with IPT at rates at least seven times the rate of whites over the preceding three years. It's these cases to which transit police were called. And these cases — or other cases like Dean's, that originate with police — are where disparities jump. IPT cases can originate for a variety of reasons: conflicts with bus or rail operators, disturbances on light-rail platforms, or automobile drivers who — either accidentally or otherwise — delay trains with their vehicles. TriMet's data, however, doesn't break out those details, or include information from any of the cases in which IPTs originate with police. For that reason, it's impossible to say how many of the IPT charges began with fare inspectors excluding people from riding TriMet and how many were tied to other factors, including interactions with transit police. But Lt. Tony Silva, a transit police supervisor, says only those who actually delay bus or train service are charged with IPT. With 330,000 TriMet trips a day, including up to 600 buses at peak times and about 66 trains and 103 platforms, even one train or bus stalled by a problem passenger can create a cascade of troubles. "In the peak hours when all those trains are running, if you stop one train for 10 minutes you can see how quickly that dominos back and the whole system gets stopped," Silva said. "And so that's part of the reason to keep the system moving. And people depend on it." TriMet officials say they don't have the ability to collect data to show how their efforts to keep the trains and buses running on time are intersecting with the criminal justice system. But TriMet is working on solutions intended to keep people out of the system for fare-related fines. Things like paying reduced fines or doing community service to opt out of the case before it heads to court. And TriMet has taken over control of its own hearing process, in which those excluded from riding can dispute the exclusion or get partial permissions to ride. That will make it easier to retool exclusions so that people aren't faced with the dilemma of, for example, riding excluded or not getting to a job or to school. In early March, the Portland Tribune reported that TriMet is directing its bus operators to accept partial payment instead of full fare and not exclude nonpaying riders from buses. Instead, TriMet tells drivers to alert dispatchers who can send police if available. TriMet officials say they're not getting soft on crime. They still plan to expand the amount of fare inspections on the system and educate riders about consequences for violations — and how to ask for help if they're too harsh. And, they plan to increase training for operators on how to de-escalate encounters like the one with Dean. Dean's handcuffs were loose and they came off. It was an accident. Still, even after he told the officers he'd come loose, there was a whole lot of restraining him in the back of the car until his hands were bound again, until he was squished up trying to breathe and wondering how far it would all go. "I was just thinking about all those videos and thinking, 'I don't want to be another hashtag,' " Dean said. Still, to Dean, the hard part came later. When the video hit Facebook, filmed by another rider on the bus, his life became something that wasn't his anymore. Phone calls from the media. People stopping him on the street ("Oh, you're that guy"). Messages that besieged his Facebook page. "It was just too much attention," he said. "It was something that really took a toll on me. My head. My body. At times I didn't want to pick up my phone." Later, Dean says his public defender couldn't understand why he wouldn't just take the deal — a conviction with community service only. But he had a problem with that. He didn't think he'd done anything wrong. "The whole scenario was just backwards," he said. And start to finish, even in the court, it stayed that way. In the end, the advice he got was the advice he didn't want: to say he was guilty, to sign a paper that said he "knowingly and unlawfully remained on a public transit vehicle." Just to be done with it. In his mind it was far afield from justice, however practical. And yet, somehow, the deal was the best the justice system could do. Portland State University: PSU analyzed TriMet's enforcement procedures for disparities at TriMet's request, following complaints by riders. 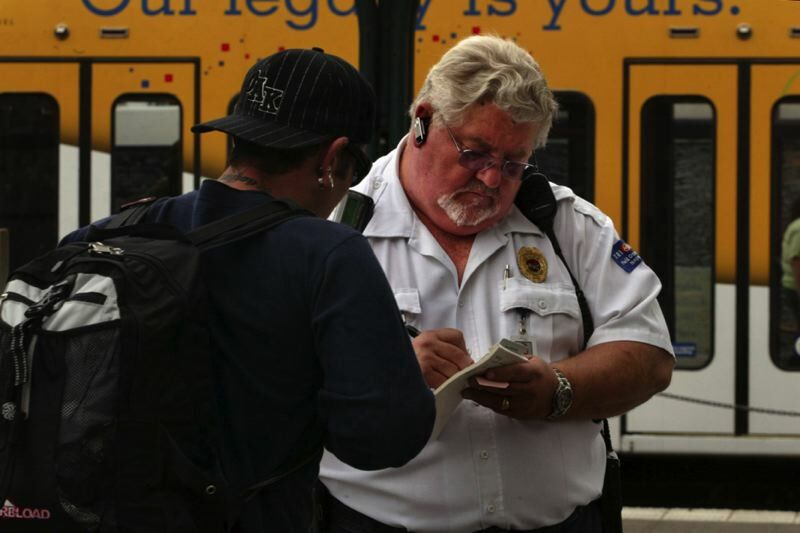 The study looked only at the practices of fare inspectors and supervisors employed by TriMet. It was released late last year, and found no disparity in enforcement practices, but higher rates of exclusion for black riders. Multnomah County district attorney: Prosecutors studied three years of charges for interfering with public transit and found African-Americans were charged at least seven times more frequently than whites. Once the PSU study confirmed the higher rate of exclusion — often a precursor to being charged with interfering with public transit — local district attorneys stopped issuing the charge. 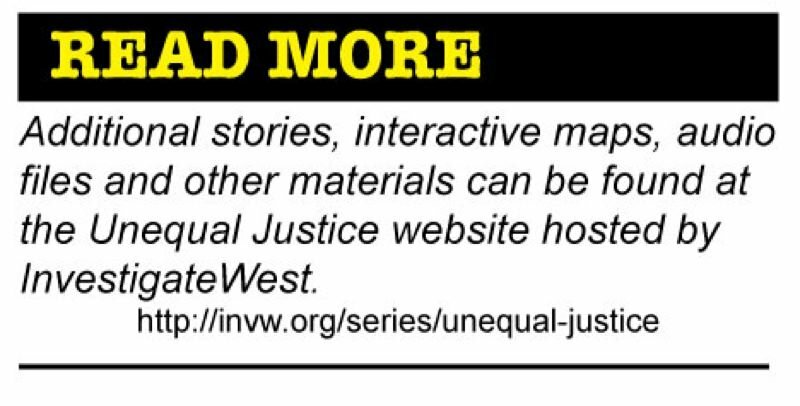 Unequal justice: Reporter Kate Willson, with support from the National Institute for Computer-Assisted Reporting and criminologist Mark G. Harmon, examined a decade's worth of charges for interfering with public transit by race. The series found African-Americans had been charged with interfering with public transit at a rate of 6.4 times the rate of whites. All of the studies above used ridership data supplied by TriMet as its baseline for population demographics. Not everybody cited for fare evasion on TriMet thinks they were a target. Chad Fowler, 28, a recent African-American transplant from Baltimore, was caught skipping the fare in one of TriMet's standard enforcement checks at Skidmore Fountain in May 2015. When the doors opened and he stepped off, there he was, in a corral of passengers often dubbed "the funnel," being asked by a fare inspector to show a valid ticket for the ride. "I kind of brought it upon myself," Fowler shrugged. One hundred and seventy-five dollars later, he said he'd learned. The Portland State University study found that this type of fare check at MAX stations doesn't result in racial disparities. Nor do the walk-throughs by fare inspectors, who occasionally board a light-rail car and check the fares of all the passengers. Local defense attorneys say Brandon Dean's story — or stories like it — are common on TriMet. So common that when asked about a different incident in which a rider was charged with interfering with public transit, public defender Chris O'Connor was able to recite details without ever seeing the file. Words like "officer safety" are common when a fare evader is taken to the ground, he said, and "mere conversation" tends to kick off a bad exchange. O'Connor says he's read enough reports to get a good sense whether a charge of resisting is warranted, or tacked on to a fare evasion citation without justification. "I can read a police report and know whether it's real," O'Connor says. Fighting the charges takes time. A person can sit for several hours on five or six different dates just to get a trial, O'Connor says. And those court appearances can threaten jobs, cost money and lots of time on TriMet buses or trains, or cause logistical problems for those who can no longer ride. Those accused of interfering with public transit are routinely allowed to enter a simple plea of guilty in exchange for community service. For many, that offer becomes an attractive alternative to probation, suspended sentences, or a long wait for a time-consuming trial. But those plea deals come back to bite people later, O'Connor says, after cases pile up and a more serious crime lands someone higher on a sentencing grid. "It's dispiriting," he says. TriMet's fare enforcement is complicated by the fact that the agency doesn't use turnstiles or gates to prevent people without MAX tickets on the light-rail platforms. Instead, to discourage "fare jumpers," the agency conducts random inspections of passengers either riding or exiting the light-rail cars. And on buses, the agency recently instructed operators not to prevent those without full fares from riding, to avoid conflicts. Here's what you can expect if you are caught without full fare. • Warnings: TriMet still issues warnings, but at the discretion of fare enforcement staff. You're just as likely to get a citation if you've skipped the fare, or harsher penalties if you're behaving badly, so don't bet on the first-time freebie. • Citations: If you've skipped the fare and get a citation, it will cost you $175. Take it with a smile — penalties can get worse if you don't. • Exclusion: If you have a history of skipping the fare and are caught, are behaving badly on TriMet, or some combination of both, you may be excluded from riding. TriMet fare enforcement staff have discretion over what's most appropriate, based on the seriousness of the situation, your behavior, and your history of violations on TriMet. Once excluded from TriMet, you either have to find other means of transportation for at least 30 days — or you can request a hearing to plead your case to ride sooner. Sometimes excluded riders are allowed limited access to public transit to get to jobs or school. • Interfering with public transit: This is where the police come in. If you've had an encounter with a TriMet fare enforcement staff that isn't going well, or you've had a conflict with a driver or other passengers that prompts someone to call police, you could be charged with interfering with public transit for holding up the system. The charge is a misdemeanor and is processed by the courts. That means you're facing fines, fees, community service, even jail time based on your history. Such situations often also involve exclusion from TriMet.